A trip to Australia is almost a given for Kiwis – many of you will end up living over there at some point in your life – and if you’re going to drive over there you’ll need to be aware of the animals you’ll encounter on the road. 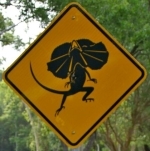 While the road rules are very similar, Australia has a large number of animals and birds that are big enough to cause a danger on the road. Just like in New Zealand, cattle are raised in Australia, but once you get into the outback you’ll find great ranches where the territory is controlled by cattle grids rather than fences, and this means stock wandering on the road at any time. Camels were first introduced to help with work on the railways. Now they’re reaching pest proportions with around 300,000 of them roaming various areas, predominantly in the centre and north. It’s unlikely you’ll see them in or around major cities. Kangaroos and wallabies are found almost everywhere in Australia. They blend in well with the surrounding vegetation and have a tendency to jump out in front of moving vehicles when frightened. A large male red kangaroo can run (jump) at 70kph and weigh 90kg. Hitting one at speed in a small car can write the car off. Emus are large flightless birds. They can sprint at up to 50kph, stand 2m tall and weigh 60kg. Hitting one can cause significant damage. The legs are likely to be taken from under it and the body then becomes a projectile aimed at your windscreen. Lyrebirds are ground-dwelling birds found in rainforest areas of Victoria, New South Wales and south-east Queensland. We most typically think of koalas in trees, but they do spend time on the ground and can gallop at speed. Platypus are elusive creatures – seeing one in the wild often takes some effort. It is found all along the eastern coast of Australia. While we have a population problem with possums in New Zealand, in Australia they are endangered and protected. The Tasmanian Devil is only found in Tasmania. You can find tree kangaroos in north-eastern Queensland. 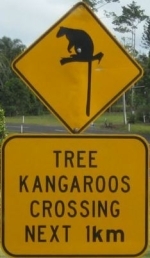 They are critically endangered, so take care when driving if you see this sign. Wild horses can be found in many places in Australia. Wombats are solid, ground-dwelling marsupials that can run at 40kph and weigh up to 35kg. Hitting one will cause damage to your car. This sign is near a water source and shows turtles and ducks. Turtles cannot move quickly out of the way of vehicles, and ducks are generally too stupid to move quickly. Be prepared to stop. Bandicoots are small to medium-sized marsupials that are active mostly at night. 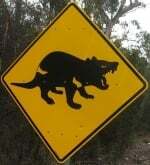 This type of sign is often seen in outback regions where numerous larger mammals can be roaming on the roads. Cassowaries are large flightless birds smaller only than the ostrich and emu. They are endangered throughout their range in the northeastern rainforests in Queensland. 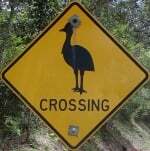 Speeding cars are a danger to cassowaries that tend to be active at dusk and dawn. Cars are responsible for over 50% of cassowary deaths. Penguins are found in Australia and smaller ones, like the Little Blue Penguin that’s found here in New Zealand, can shelter under cars. Ducks are no smarter in Australia than anywhere else in the world and will simply sit on the road oblivious to danger. Be prepared to stop. Echidnas are found in urban and wilderness areas. Lizards of many varieties are found throughout Australia, sometimes basking on hot tarmac. 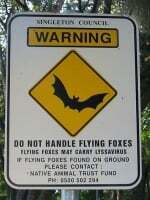 Fruit bats can be a problem in some urban areas. While you’re unlikely to hit one with your car, parking under a tree where they roost can mean a sticky mess for you to clean off the roof when you get back. Venomous snakes range throughout Australia. They often bask on the roads. If you run one over, don’t get out to see how it’s doing as it might bite you.